Since our humble beginnings in 2005 with a small space in Toronto's trendy Yorkville district, Veda's growth has been inspired with the passion to cook and serve healthy, Indian-inspired takeout cuisine. Unlike other Indian restaurants, Veda was created with the specific intention to be different. We know many people love Indian food, but many of them dislike or are unaware of the commonly unhealthy ingredients that make typical Indian food taste so good. Our menu features items that use the healthy and aromatic spices, but leaves out the fattening ghee, butter, oil, and heavy cream. Veda has grown to include four wonderful takeout locations in Toronto with more to come in the near future. Our team takes pride in the fact that we can provide our new and loyal customers with great tasting Indian-inspired food that is unlike that at any other Indian restaurant you frequent. We recognize that some people are still looking for the typical Indian food, and that's fine with us. Our disclaimer is that if you're expecting heavy, oily, unhealthy Indian food, then Veda is NOT the place for you. Our hope is that you'll join the growing trend that so many others have already discovered and you will try Veda as a unique alternative not just to other Indian restaurants, but to all other healthy food options out there! 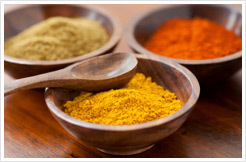 For thousands of years, people throughout Southeast Asia, and many other Asian countries, have been using fresh spices and natural ingredients for various healing benefits. They cook these ingredients using a slow and measured approach taking great care in the process. The art of cooking has become a philosophy - one that has been lost in the fast-paced nature of Western cultures. 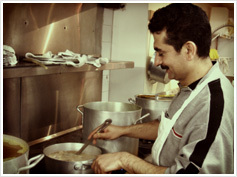 At Veda, we take Indian-inspired food to a whole new level with our healthy cooking approach and techniques. We have adopted some techniques from the old philosophies and believe that cooking Indian food must be done slowly and deliberately. If another Indian restaurant tells you they just cooked your lentils from scratch and are serving them to you made-to-order, you might want to question them. It takes a long time to prepare Indian food and it must be done with passion. Since we're a fast food and delivery service, we have learned how to make all our curries in large batches and serve them only when they are fully cooked meeting our strict quality standards. We have analyzed our cooking times and processes to ensure the proper preparation and cooking times, the same way you would cook for yourself at home. Our food is always made from scratch with no preservatives or artificial flavours and most importantly, we have done all this and still been able to completely remove the traditional ghee, heavy creams, and oils with trans fats, while maintaining our own unique great flavours. With our natural ingredients and fresh-milled spices, you can enjoy a guilt-free meal that is quick, easy, affordable, and delicious. More often than ever, our customers have been telling us that they cannot get a straight answer about what they are eating in most restaurants. On top of that, even when people or labels tell us what's inside, often we can't understand what certain ingredients are. Our belief is that if you can't spell an ingredient, then you shouldn't eat it. We post most of the common dietary requirements in our own legend right next to each menu item. Anything not listed can be obtained by our friendly and knowledgeable staff. At Veda we firmly believe in knowing what you eat, so please don't hesitate to ask us. You can be assured that none of the food we make in our kitchens has any artificial ingredients, preservatives, or undesirable additives. At Veda, we believe in being transparent with the ingredients used in our cooking. This means that we only use natural ingredients without any artificial additives or bi-products. If you have a special dietary need, we're happy to tell you the ingredients as our commitment to being transparent. If you can't consume something, we don't want to feed it to you, so we take allergy and dietary requirements very seriously. In fact, on our menu you will find a legend with some common dietary requirements like gluten-free and lactose-free items. You'll also notice in our menu that many items are Vegan as part of our commitment to being all-inclusive to as many customers as possible. If you have special dietary requirements or allergies, don't hesitate to ask our staff as we are committed to being transparent. We don't expect our staff to know every ingredient, so we have an ingredient list posted for our staff in every location. Veda means 'knowledge' in the Indian scriptural language of Sanskrit. Taken literally, Veda describes a sense of healthy living through the knowledge of mind, body, and spirit. When we heard this translation, it resonated with us so much that we decided to name our restaurants Veda. What sets Veda apart from other eateries is our drive to provide a unique alternative to the traditionally unhealthy nature of Indian food. While we admit that simply eating healthy food is not enough to live a complete and well-balanced lifestyle, we can play an integral part by providing people with more options to eat healthy. We strongly encourage all our customers to become in tune with their own mind, body, and spirit by including Veda as a part of a balanced lifestyle that also includes exercise of the body and mind. From fresh-milled spices to natural ingredients, we think you and your body will appreciate the wholesome and authentic nature of our food. To top it off, our customer service will never let you down. We hope you enjoy your Veda experience!